Germany's Ulla Salzgeber, winning rider at the eighth leg of the 2010/2011 Reem Acra FEI World Cup™ Dressage series in Neumunster, Germany today riding Herzuf's Erbe is presented with the trophy by Lisa Wells, Reem Acra. Ulla Salzgeber and Herzuf's Erbe swept to their second victory in the Western European League of the 2010/2011 Reem Acra FEI World Cup™ Dressage series in Neumunster, Germany today where fellow-Germans Isabell Werth and Helen Langehanenberg slotted into second and third places. Salzgeber has been in formidable form all season, placing herself in a prominent position on the leaderboard when winning the Central European League qualifier at Kaposvar in Hungary last October before coming out to win again at Frankfurt, Germany in December. And the 52 year old rider did it in style once more today, getting the edge over Werth with a performance that oozed professionalism, confidence, control and harmony and which restored her to pole position on the league table ahead of the final two qualifying rounds. The Holstenhalle in Neumunster is an atmospheric venue that buzzes with the excitement of its informed and enthusiastic audience, so horses are tested to the limit. Despite the tension however, the 15 starters however produced work of the highest calibre. “We all love to work as a judge and to see spectators close to the riders" said Ground Jury President Gary Rockwell afterwards. "But in Neumünster the atmosphere is extraordinary - you can feel the electricity and the enthusiasm for each competitor - it's a lot of pressure!” he pointed out. It was The Netherlands' Christa Laarakkers who had the advantage going into the half-way break having reset the target-score at 73.125% with Divoza Horseworld Ovation, but that was immediately dismissed by a mark of 74.275% from Germany's Anja Plonzke who steered the 12 year old Le Mont d'Or through an energetic and rhythmic display as the action resumed. And from there it just kept getting better. Jeroen Devroe and Apollo van het Vijverhof produced a most elegant passage during their calm and polished performance to raise the bar to 76.350% and that was always going to keep the Belgian duo in contention. However next to go was Werth with Madeleine Winter-Schulze's 17 year old Satchmo and the 41 year old rider was smiling even before she began. Patting Satchmo both in front and behind the saddle as she put in her final preparations, the four-time Olympic team gold medallist set off with gusto and quickly picked up big marks for fine pirouettes and expressive trot half-passes during which the horse really stretched for his stride. Not content with having clearly made a big impression already, Werth finished with one-handed piaffe and extended trot down the centre line for another leading score of 80.850%. That was now always going to be the one to beat, but Salzgeber would not be intimidated. She followed the 76.200% from Denmark's Princess Nathalie zu Sayn-Wittgenstein and Digby with a spell-binding ride that earned the only artistic mark of 90.00 handed out by the judging panel today - from judge at B, Leif Tornblad - as she soared ahead with a score of 81.350%. Her strong chestnut with his big, deep chest and powerful shoulders seems designed perfectly for this job and created fabulous extended trot and piaffe along with controlled and balanced passage as the clear messages from Salzgeber's experienced hands and perfectly-positioned legs invited him to give of his best. As she also finished with a one-handed flourish there was no doubt that the lead had changed once again. And it would be for the final time, although The Netherlands' Hans Peter Minderhoud and Exquis Nadine's mark of 77.100% was good enough for fourth behind the final competitor of the day - Helen Langehanenberg - who scored 77.665% with Damon Hill NRW to slot into third. Langehanenberg, who with her husband runs a string of 20 horses from their base at a rented stable-yard near Munster in Germany, has been enjoying a great season with her top two rides Damon Hill and Rsponsible and is now well-qualified for the 2010/2011 Reem Acra FEI World Cup™ Dressage final which kicks off in Leipzig, Germany on 27 April. "I only ever dreamed of having a season like this!" Langehanenberg admitted today. And she must now decide whether to campaign at one or both of the last two legs of the qualifying series. "I will talk with my trainer Klaus Balkenhol - maybe I will go to Goteborg or Den Bosch but I'm not sure. Perhaps Den Bosch would be good because then I have about a month before the final, but its great to be in this position right now" she said. Werth was also delighted with her result - "I'm really pleased with Satchmo today, he did a great job. There was a little mistake in the two-tempis, but the result was quite close. Satchmo is brave and I decided to really go for it at the end of the test today - it might have been a bit over the top but dressage should be fun too, and not always so serious!" she said with a laugh. For further information on the Reem Acra FEI World Cup™ Dressage qualifier at Neumunster, Germany check out website www.reitturnier.de or contact Press Officer Andreas Kerstan at Email andreas.kerstan@comtainment.de, Tel +49 4307 827973 / +49 3416 786012. The next leg will take place in Gothenburg, Sweden 24-27 February. For information on the Swedish fixture go to www.goteborghorseshow.se or contact Press Officer Mayvor Thorin at Email mayvor.thorin@gotevent.se / Tel: +46 705 828 420. RESULT: 1, Herzuf's Erbe (Ulla Salzgeber) GER 81.350; 2, Satchmo (Isabell Werth) GER 80.850; 3, Damon Hill NRW (Helen Langehanenberg) GER 77.675; 4, Exquis Nadine (Hans Peter Minderhoud) NED 77.100; 5, Apollo van het Vijverhof (Jeroen Devroe) BEL 76.350; 6, Digby (Nathalie zu Sayn-Wittgenstein) DEN 76.200; 7, Le Mont d'Or (Anja Plonzke) GER 74.275; 8, Divoza Horseworld Ovation (Christa Laarakkers) NED 73.125; 9, Skovlunds Mas Guapo (Mikaela Lindh) FIN 72.025; 10, Le Bo (Carola Koppelmann) ger 71.625; 11, Edwador (Katarzyna Milczarek) POL 71.525; 12, Pro Set (Lillann Jebsen) NOR 70.150; 12, Sal (Nuno Palma E Santos) POR 70.150; 14, Leo of Magnushoj (Nina Hofmann) SWE 68.150; 15, Prins (Susan de Klein) AHO 66.225. German riders claimed the top three placings at today's competition in Neumunster, Germany. There were 5 representatives from Germany amongst the 15 starters. Today's winner, Germany's Ulla Salzgeber, previously won the fifth leg of the Western European League at Frankfurt, Germany in December and also recorded a victory in the Central European League series at Kaposvar, Hungary last October. German riders now fill three of the top six placings on the Western European League leaderboard - Ulla Salzgeber in first place, Isabell Werth in second and Helen Lengehanenberg in sixth. Two further qualifying opportunities remain - at Gothenburg, Sweden 24-27 February and 's-Hertogenbosch, The Netherlands 24-27 March. 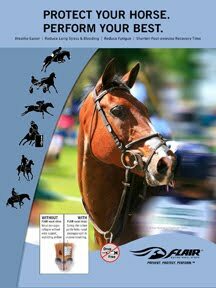 The 2010/2011 Reem Acra FEI World Cup™ Dressage final takes place in Leipzig, Germany 27 April to 1 May. The Ground Jury at Neumunster included At E - Mariette Withages-Dieltjes, At M - Katrina Wust, At H - Peter Holler, At B - Leif Tornblad, At C - Gary Rockwell. Isabell Werth - "For sure I have plenty of points to get to the Final now but I will be going to Gothenburg next weekend because I'm a hard-working lady and I am lucky enough to have three great horses in the top ten right now - that means I have to compete a lot more!" 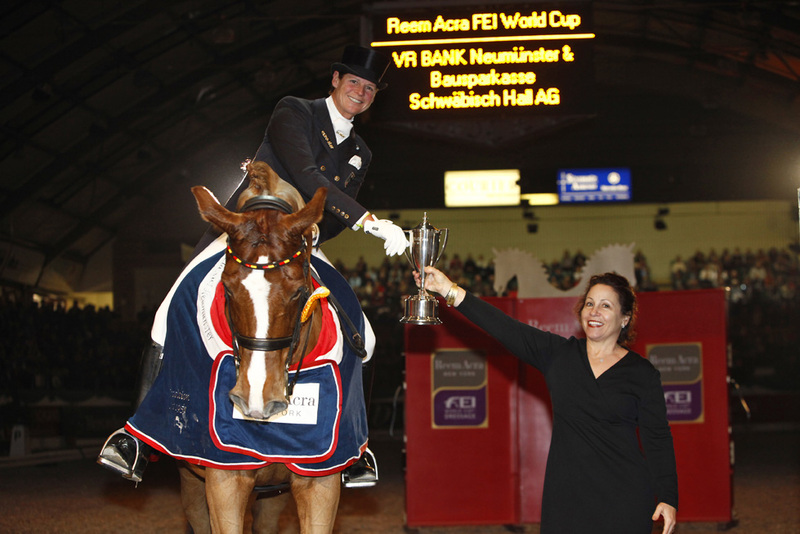 Isabell Werth - "I will ride Satchmo at the Final in Leipzig". Helen Langehanenberg - "I have Responsible for seven years now so we know each other very well. I have Damon Hill since last May, but I also rode this horse as a five year old when we won the World Cup for Young Horses. Damon Hill is very consistent and is getting better all the time - I really believe in him". FEI World Cup™ Dressage, the only worldwide series in this discipline, has entered its 26th season. The series, created in 1985, comprises four leagues: Western European, Central European, North American (including Canada) and Pacific (Australia, New Zealand, Asia). Each FEI World Cup™ Dressage qualifier consists of a Grand Prix test, which in turn is a qualification for the Freestyle to music competition, where league points are accumulated towards places in the Final. Judged on both technical and artistic merit, the FEI World Cup™ Dressage combines art, sport and partnership between horse and rider at the highest level and consistently proves a winning formula with audiences all over the world. Technical Note: The FEI World Cup Dressage™ Champion does not earn points in his/her starts but is automatically qualified to the next Final with two FEI World Cup™ Dressage qualifiers completed. 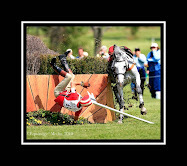 Riders not belonging to the Western European League (WEL) or Central European League (CEL) cannot earn points in the WEL unless they have declared to compete in the WEL 2009/2010. These riders may however transfer the results from a maximum of three (3) WEL qualifiers to their own League. Points earned by CEL riders will be transferred to the CEL standings.